Our Bible Study group has finally reached 1 Corinthians 11. It’s one of those chapters in the letter that turns at least a few heads. The opening verses focus on the appropriate dress for worship; with questions of head coverings for women being central. Interestingly, considering what Paul writes in chapter 14, while women need head coverings—whether a veil or long hair isn’t exactly clear (perhaps both—they can pray and prophesy. I’ve always found verse 16 intriguing, as Paul essentially admits that if anyone wants to argue about what he’s just said, he’s ready to let it go (or at least that’s how it seems to read). While that is interesting material, it’s not the piece I wanted to pick up in this post. The word about hair and clothing when going to church (how many of us in the 1960s and 1970s heard Paul quoted about long hair being a disgrace for a man, despite Jesus being pictured with long hair and a beard). What I wanted to lift up is the message concerning the meal, which Paul details in this chapter. Paul is concerned about proper decorum, about eating the meal worthily or appropriately. He speaks of discerning the body and people getting sick and dying. Again, there is much here that is confusing and unclear. We would assume the Corinthians knew what Paul was getting at, but can we truly understand? My sense is that Paul is trying to deal, as he has been dealing, with the social stratification of Greco-Roman society that is plaguing the congregation. Some had lots to eat. Others not much. Those with food and drink were over-indulging, while their poorer brothers and sisters were going without. At one point, Paul tells the congregants to wait until everyone is present before eating, assumedly so a fair distribution can be made. Most likely the wealthy members arrived first, and may have started eating and drinking, leaving nothing for the poorer members who had to work longer hours. Thus, Paul tells people that if they’re hungry, eat first. The title of the post speaks of the eschatological (future-oriented) nature of the meal. It is clear that Paul has the Lord’s Supper in mind here. Most likely this is still a full meal, and not only the Eucharist. Standing in the middle of the discussion of decorum at the Table comes the tradition Paul had received from the Lord and had passed on to them concerning Jesus’ final meal with the disciples. Here we find the earliest known form of the Words of Institution, a form of which are normally pronounced over the Eucharistic elements. Paul notes that in his Words of Institution, Jesus asked that he be remembered each time they share the elements. The piece I want to pick up on is found in verse 26. Here Paul writes: “Every time you eat this bread and drink this cup, you broadcast the death of the Lord until he comes.” (CEB). It’s that last phrase that is key. We’re to do this “until he comes.” The assumption is that Jesus will return, though perhaps not in Douglas MacArthur mode, though many Christians picture Jesus in nearly such a pose. In preparation to teach this passage, I was reading the commentary by C.K. Barrett (a commentary I have had since seminary and find to be always beneficial), and it is clear that Paul was working with the assumption that Jesus would return in his lifetime. We can see this in his instructions about marriage in chapter 7. Thus, according to Barrett, “the church as it met around the supper table would form a living link between the beginning and the end of the interim between the two comings of the Lord” [First Epistle to the Corinthians, p. 271]. We live more than two millennia later. Paul’s expectations did not come to fruition. We’re still here, but are we waiting? And we continue with the meal, as he asked, in his remembrance. 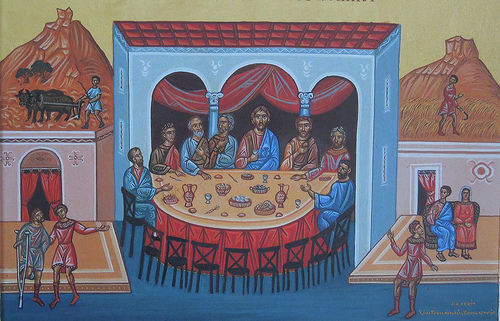 As Barrett notes: “The historic meal in the shadow of the cross, of the glorious banquet of the kingdom of God; the resurrection did not alter the situation, though it confirmed the hope and faith of the disciples participating in the meal” (Barrett, pp. 271-272). Paul’s words here, along with Barrett’s interpretation of them, serves as a reminder that even though we may look back (to remember), we also look forward to that final banquet of the realm of God, which the meal we partake of in the here and now is but an anticipation. How might you discern the meaning and implications of this eschatological meal? What future does it suggest to us? What kind of life does it suggest for the here and now? What are the expectations of God? Considering the context in which these words appear, how might the meal upend our culture's social/cultural expectations? As Charles Campbell puts it, "The church cannot proclaim this radically disruptive, apocalyptic message by continuing to accommodate to the hierarchical meal practices of the old age" [1 Corinthians, Belief, p. 191]. Our meals may not be quite the same as those of Paul's day, but how might our practices accommodate social/cultural disparity? Here the issue was socio-economic. In our context it might still include that, but other forms as well. How might the Table witness against this as we share in Christ's eschatological meal?